January 28, 2016 – The Space and Missile Systems Center released its final award notice on January 27 under the Booster Propulsion Technology Maturation Broad Agency Announcement (BAA) solicitation. A total of 10 awards have been made under BAA to support technology maturation and risk reduction for rocket propulsion system development. The Air Force’s portfolio of investments through this BAA is in the area of Material Manufacturing and Development, primarily focused on reducing the cost of future engines, and Advanced Technologies, primarily focused on advancing the state of the art for future engines. These acquisitions will mature booster propulsion technology and reduce risk for the U.S. domestic industry base. Johns Hopkins University for Evaluation of “Additively Manufactured Liquid Rocket Engine Cooling Channels” for approximately $545,000 to improve performance in next-generation rocket engine thrust chambers and cooling channels. Tanner Research Inc. for “Solid Rocket Motor (SRM) Ignition System with Built-In Test (BiT)” for approximately $902,000 to develop an ignition system that can simplify detection of defective solid rocket motors. Johns Hopkins University for “Performance Sensitivity of Rocket Engine Cooling Channels” for approximately $935,000 to address industry knowledge gaps in propellant characteristics to enable LNG/Methane booster engine development. Moog Inc for “Non-Destructive Evaluation, Standards, and Testing” for approximately $728,000 to develop additive manufacturing technology for propellant control valves for use in a wide range of liquid engine systems. Orbital ATK for “Segmented Composite Case Advanced Technology” for approximately $3.13 million to focus on reducing weight of solid rocket motor case joints and improving reliability. Aerojet-Rocketdyne for “Additive Manufacturing Qualification Process for Reduced Booster Propulsion Life Cycle Cost” for approximately $6 million to develop a qualification process for additively manufactured engine parts that does not currently exist. Northrop Grumman for “Turbopump Assembly Additive Manufacturing” for approximately $5.47 million to improve technological readiness of an additively manufactured LOX/Methane booster engine TPA for insertion into a rocket propulsion system. Boeing for “Additively Manufactured High Pressure Engine Dome” for approximately $6.19 million to develop a full scale, complex, thick-walled engine component that advances additive manufacturing state of the art, and is targeted for integration into an engine development. Arctic Slope Technical Services for “A Low Cost, High Performance Preburner for Oxygen Rich Staged Combustion (ORSC)” for approximately $3.69 million to develop a preburner that implements a “continuous dilution” approach to minimize preburner exit thermal gradients to enhance system reliability and reduce life cycle cost. Northrop Grumman for “Duct-cooled, Carbon Silicon Carbide (C/SiC) Thrust Chamber Technology” for approximately $7.03 million to demonstrate both new manufacturing technology and a new nozzle cooling approach that will lead to a lighter combustion chamber design that is less expensive to produce. The targeted completion date of this effort is January 26, 2018. 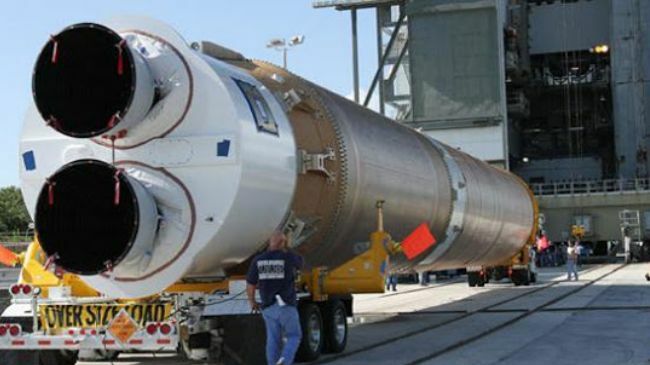 The BAA awards are part of a comprehensive Air Force plan to transition off the Russian made RD-180 propulsion system used on the United Launch Alliance Atlas V rocket by investing in industry launch solutions with the ultimate goal to competitively procure launch services in a robust domestic launch market.